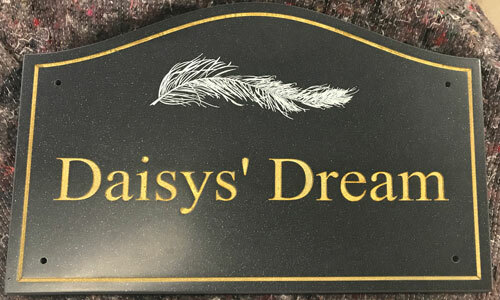 We have a large selection of house signs and home signs made in different materials. 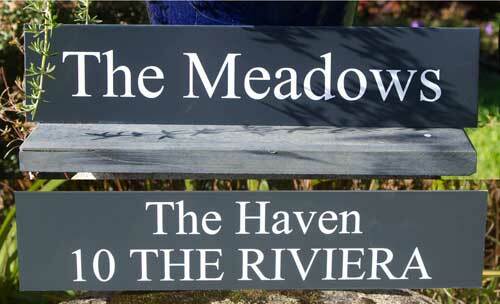 On this page we have a variety of home signs which we have made to our customers specifications. 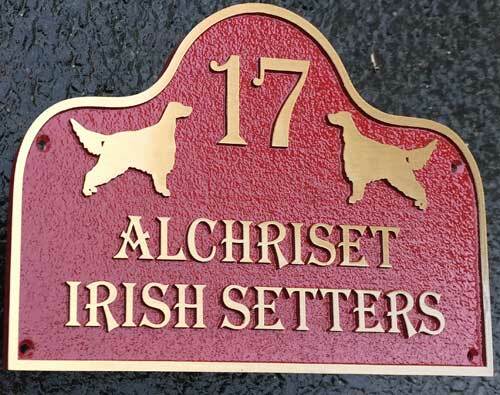 Each house sign is unique - you choose the material, the size, the font and an image if required. Have a look the photos below for inspiration. Click on the photos for more information. These are very attractive. They can be made from various timbers but oak is the most popular. The sign can be front fixed or morticed in. There is a large paint range of colours to choose from - Click here. 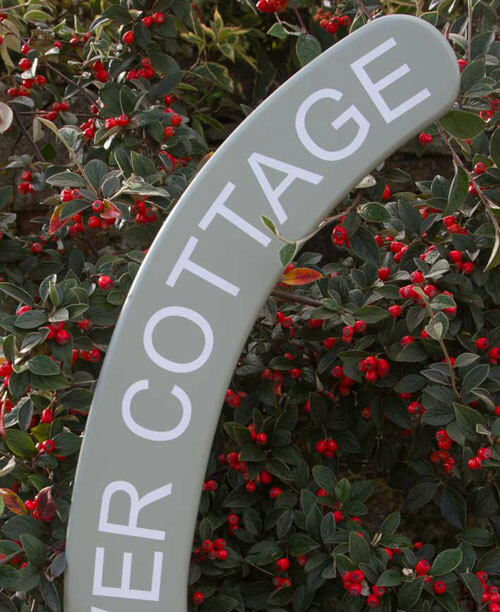 A simple sign which can be buried in the grass verge at your property entrance, Made from long lasting tricoya board which is then painted a huge range of colours. The letters on this slate house sign are raised and unpainted and the background has been sandlslated away and painted white. 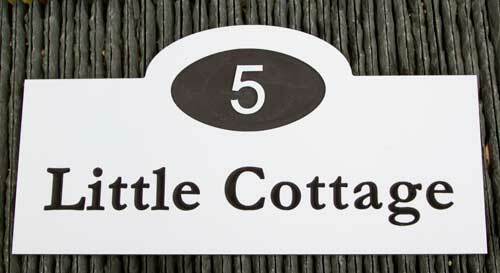 This small oak sign measured 375mm x 200mm. The image used was the customers artwork. Oak is normally finished with a long life satin varnish, but it can be oiled. 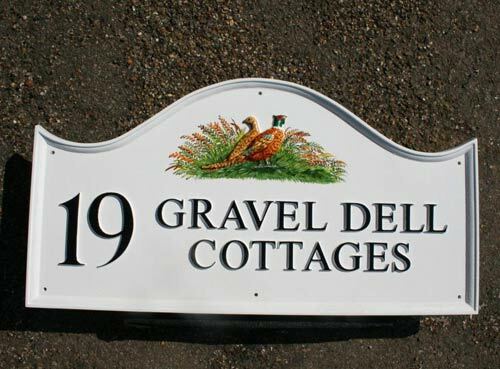 This house sign has been made from slate corian and the lettering engraved and painted white. The size is 500mm x 150mm and the border is B214. It has 4 countersunk holes. 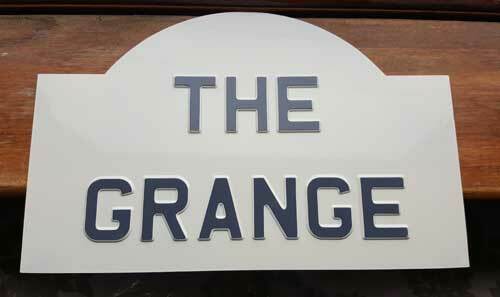 This simple home sign has been made from tough aluminium composite, cut into an oval and gold lettering then applied. The size is 300mm x 225mm. Totally weather-proof. 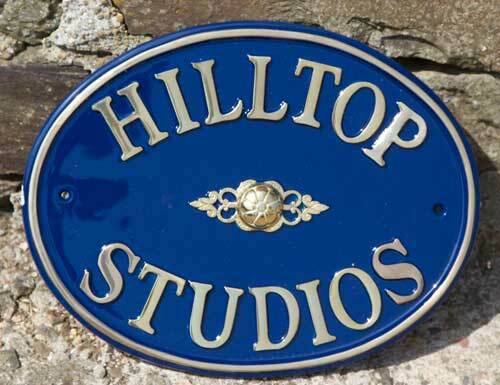 The size of this oval slate sign is 280mm x 200mm. The shell image was sent in by the customer. Two standard holes were drilled. Oval granite is also available. 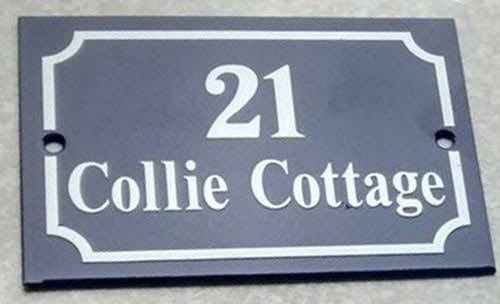 We can use aluminium composite to create full colour house signs. Either send in your artwork or tell us how you want it to look and our designers will create it for you. 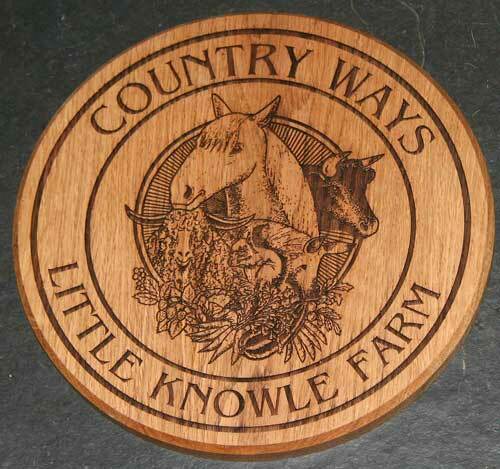 Our carpenters can make the wooden signs to most simple shapes. 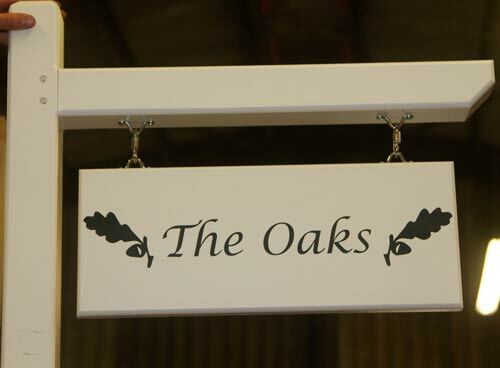 The detailed design on this oak house sign was made using a laser and was left unpainted. 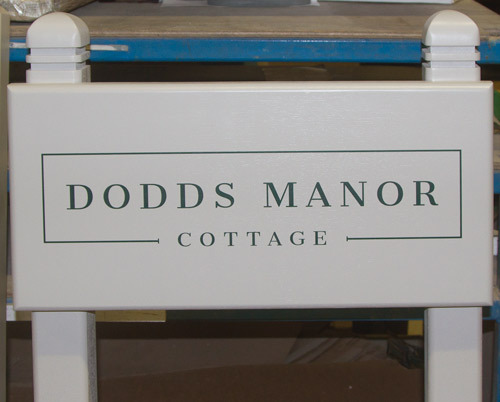 This is the medium oak framed entrance sign. The size of the green aluminum composite is 600mm x 375mm. The letter colour is gold. The posts are 1.4m in length and have the gothic style tops. This one was single signed but they can be double sided. 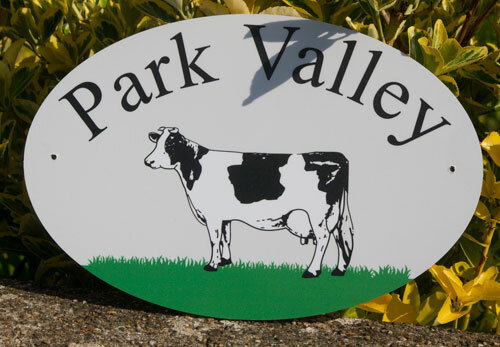 This sign was made on 25-30mm oak. It was double sided and supplied with fixings for hanging. 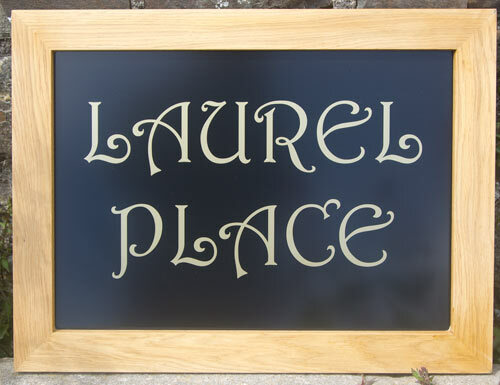 Arch top brass address sign with black background. This was then fixed to customers boulder. 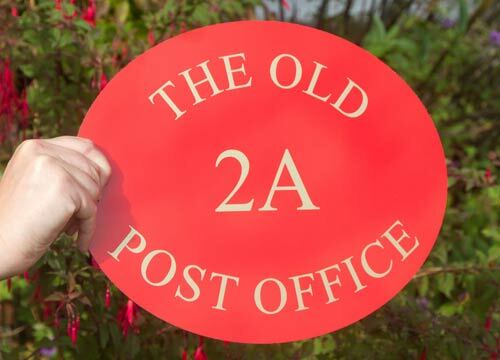 We do have a very varied range of house and home signs. We have shown a selection in the images above, but to see the full range click either of the links below. Don't forget you can call us for help. These signs measured 585mm x 100mm. 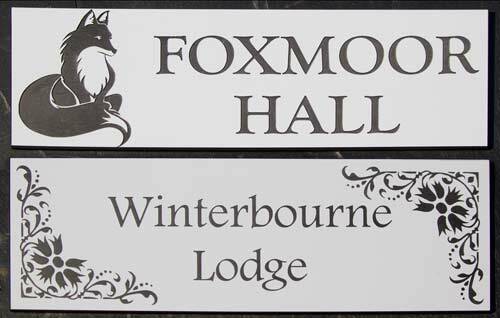 They are made from grey aluminium composite board with white vinyl lettering. Even though they are low cost, they are long lasting as well as being low maintenance. 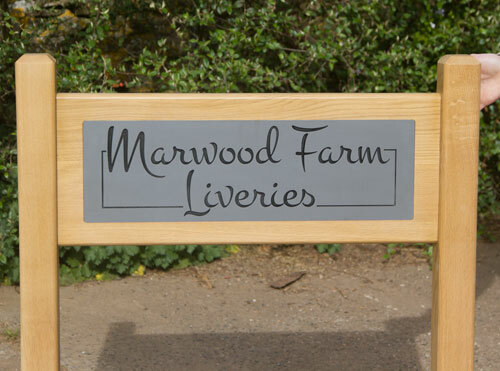 The sign itself (650mm x 200mm) was engraved into slate corian which was then inset into a solid oak panel. This panel was then morticed into oak posts. A 310mm x 150mm clear oval acrylic sign with the image and lettering on the reverse. A white backing is then applied. The sign is supplied with stand-away fixings. The sign colour is Farrow and Ball - Down Pipe Grey, the letter colour is white. The frame is made from accoya wood with the centre panel made from tricoya. Both these products are incredibly water resistant. 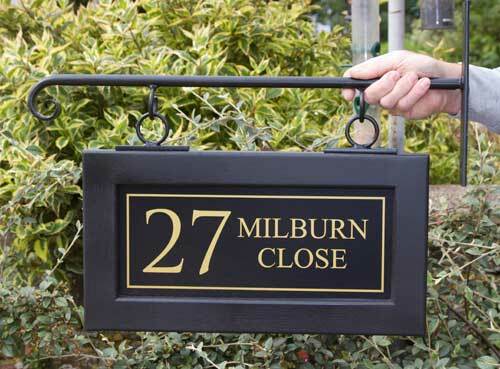 This brass address sign measured 425mm x 205mm. The brass was 3mm thick, The engraved lettering was paint filled black. It was mounted on a black wooden backing board. 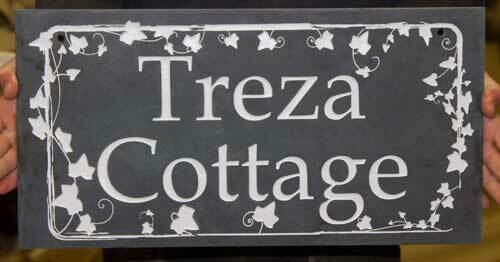 A very attractive slate coloured corian house sign. 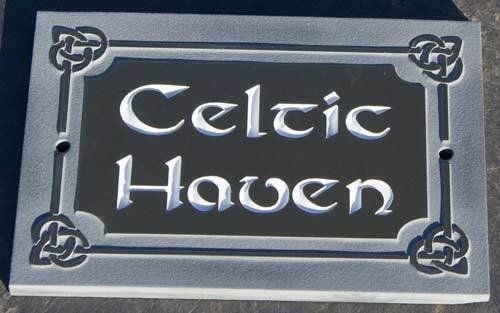 It uses a Celtic font and a decorative cetic boarder. 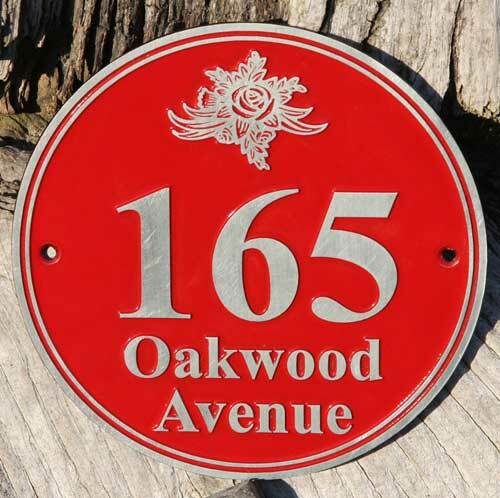 Iroko is full of its own oil so an excellent choice for a wooden house sign. Each piece of iroko is different - this one is quite light with an interesting grain. 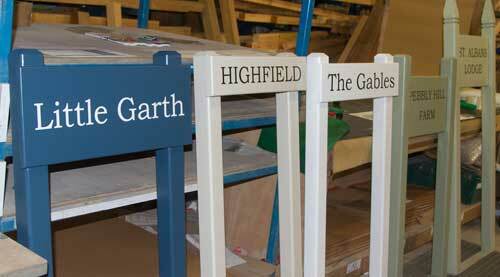 On these signs you choose the overall size and lettering will be used to suit your chosen size. Background colour can be Black, Red, Purple, Blue, Green or Maroon. 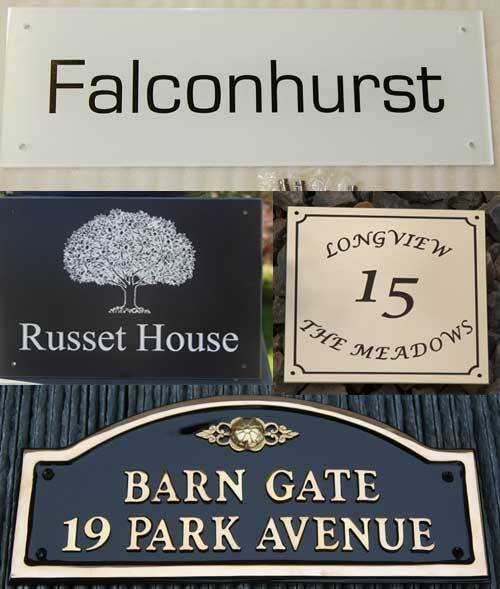 These metal house signs are low maintenance, tough, weather resistant and very hard wearing. The background is etched away and painted, leaving the lettering raised. 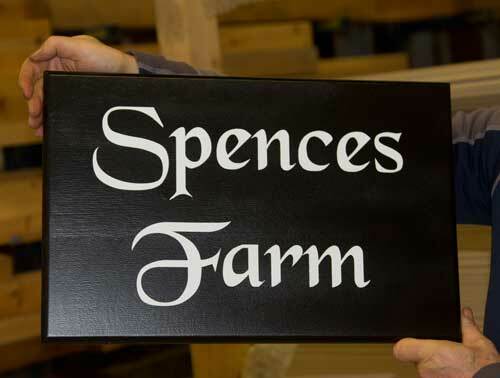 This sign was made using matt black aluminium composite with gold lettering and an oak frame. 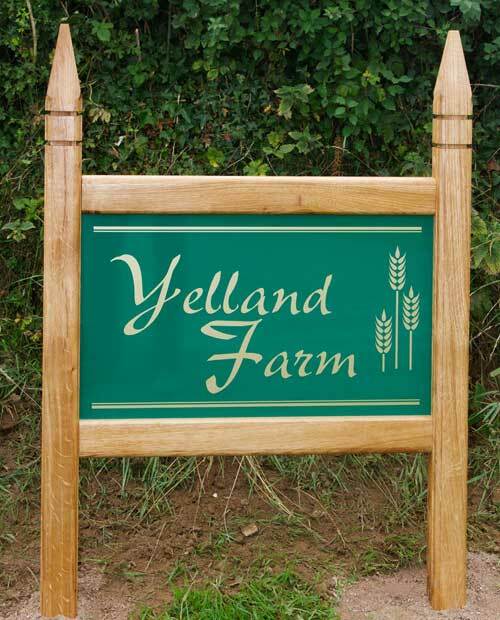 These are very durable - made from 2 ply exterior grade flexible acrylic which is weather proof and UV resistant. The letters are engraved through the first layer of laminate to show the colour underneath. 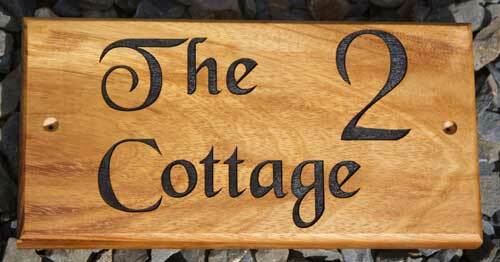 A bridge top shape is ideal if you want to include number as well as house name. We can cut this 10mm PVC to any shape. It has a matt white surface with the lettering engraved into the black recycled PVC. 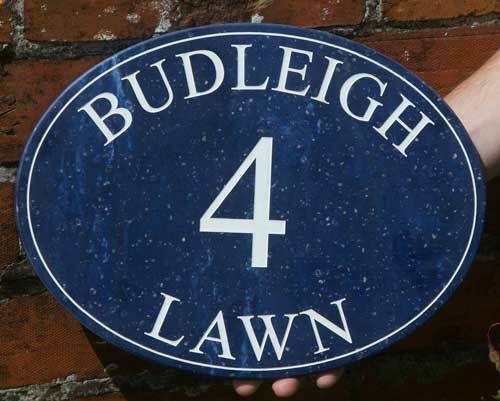 The result is an attractive yet very good value house sign. 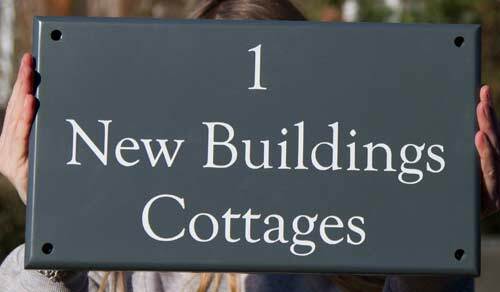 This wooden sign was painted in the colour Farrow and Ball Downpipe Grey with white letters. The timber used was the very stable and environmentally friendly accoya. 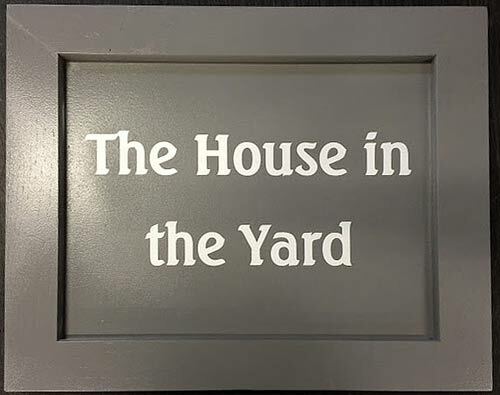 Font - Times New Roman, Size 7" x 5"
These are made in zinc plated steel which is then powder coated. It is available in five colours and has a very durable finish. 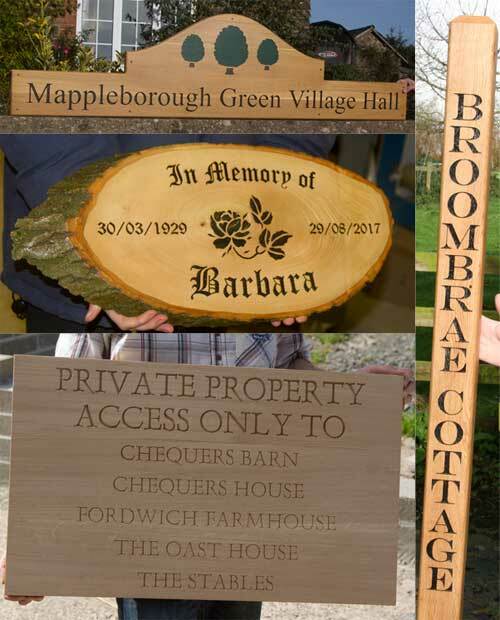 Wood, both painted or carved is often used for house and home signs - click on the link below for more ideas. 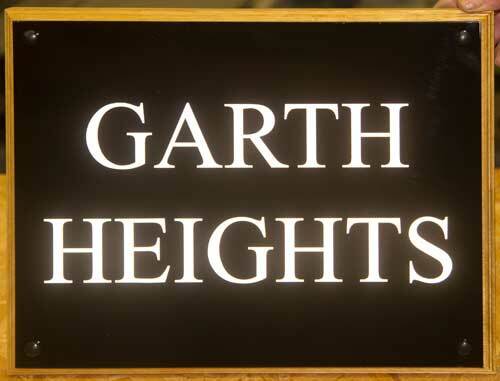 A 12mm corian sign in the colour Anthracite with a size of 600mm x 200mm. The yatch image is VS332. Paint colour white. 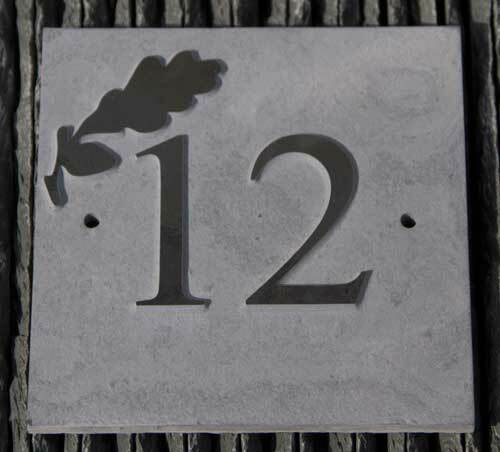 This house sign was made from 12mm shaped anthracite coloured corian. The overall size is 350mm x 250mm. Letter colours - white and gold. 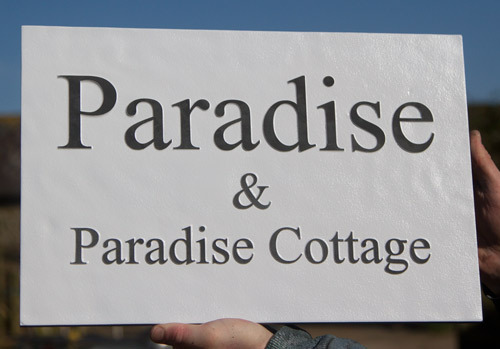 These two house signs were made from an exterior grade acrylic laminate. This material is light weight, easy to fix, long lasting and virtually maintenance free. Also very good value for money. 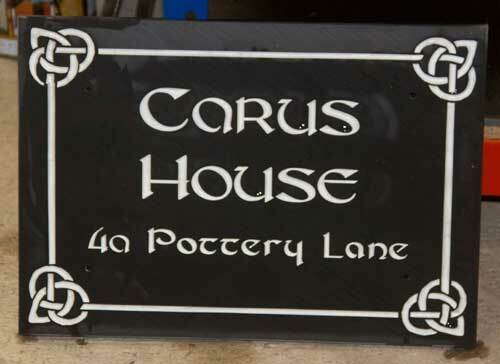 This celtic slate house sign was made from 12mm slate. 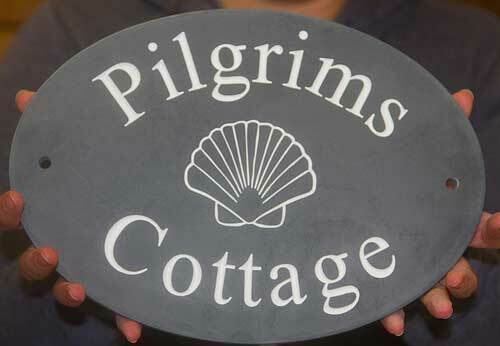 The lettering is engraved into the slate but the border has been left proud with the background sand blasted away. 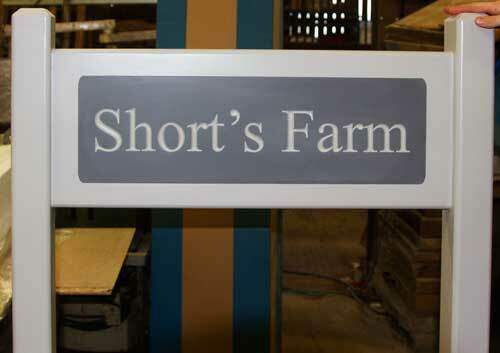 This sign was cast in top quality polyurethane and the lettering and image was then hand painted. The motif is pheasant. This product is superior to metal in many ways. The lettering is crisper and it is very long lasting. 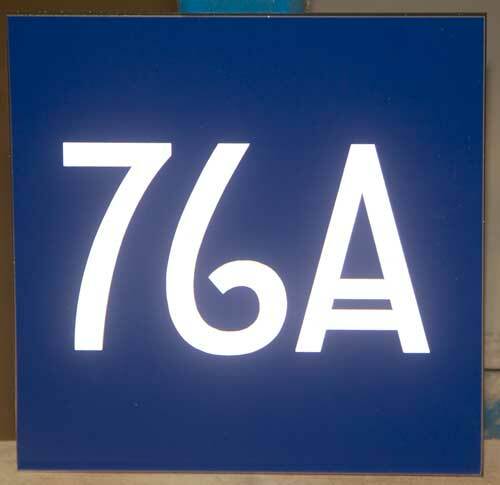 This large address sign measures 750mm x 300mm. It is made from stone like corian which is 12mm thick. The colour is black quartz and the lettering memorial quality gold. 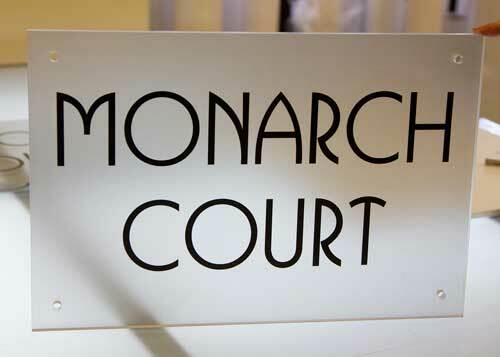 The sign panel is black aluminium composite with gold lettering applied. It has been framed with black painted oak and hung from wrought iron hanging bracket, The overall size is 485mm x 255mm. 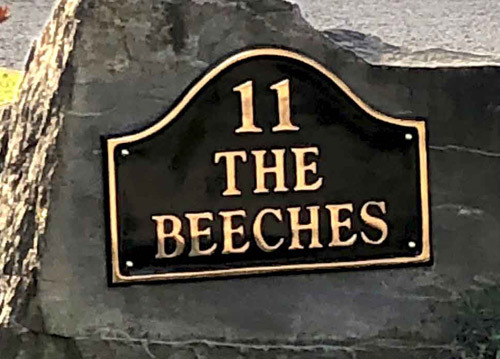 This house sign was made using black aluminium composite with reflective white lettering on an iroko wood backing board. 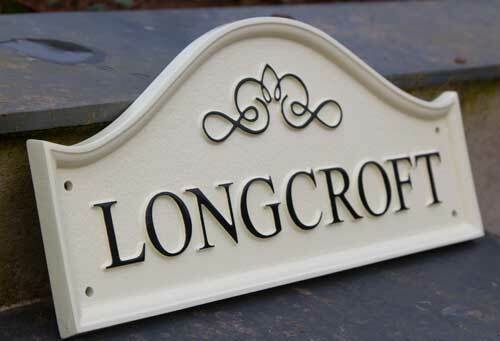 This is an engraved sign made from stone like corian. The corian colour is elderberry and the letters are paint filled white. 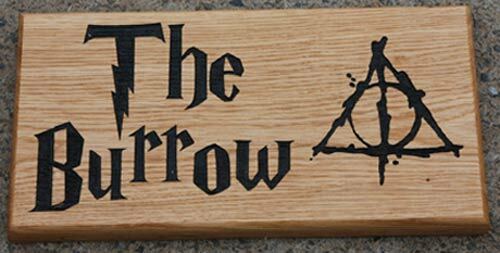 This house sign is simple but effective. 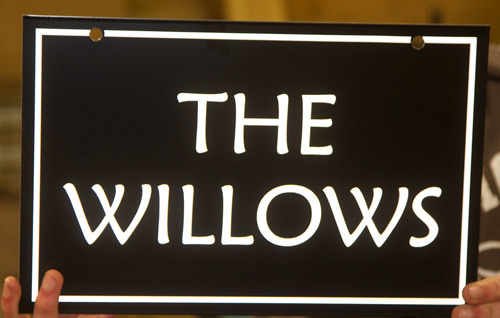 It is made from gloss green aluminium composite with silver white reflective lettering. It measures 450mm across and was supplied with green screw caps. 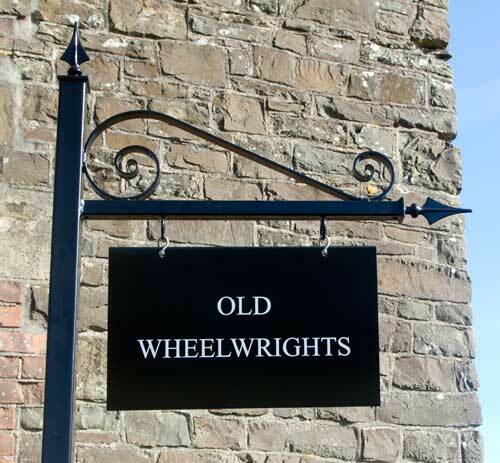 An entrance sign with very stylish text. The paint colour is F&B Purbeck Stone and the letter colour dark grey. The post tops have been shaped. The box steel posts is 2.5m high, 610mm to end box steel horizontal, 730mm in total with 300mm between hooks. 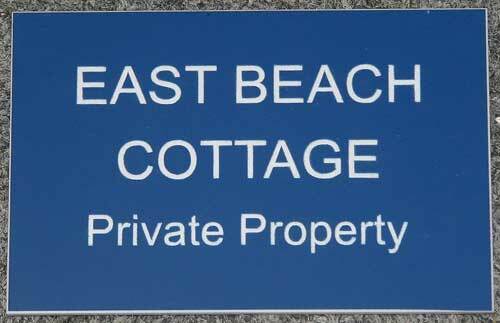 The sign here was made on aluminium composite, but it could be solid aluminium, wooden or wooden framed. 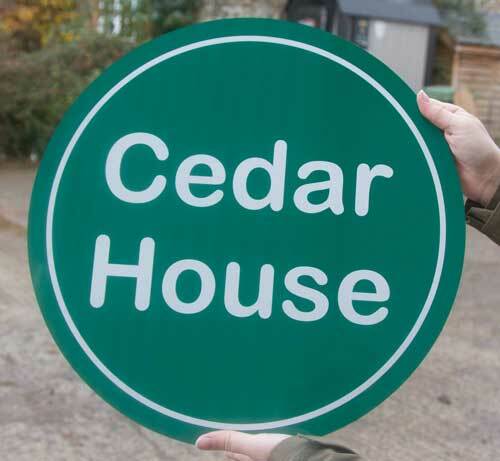 This reflective house sign has been made double sided with holes in the top for hanging it. The lettering was requested at 40mm. A simple line border finishes the sign perfectly. 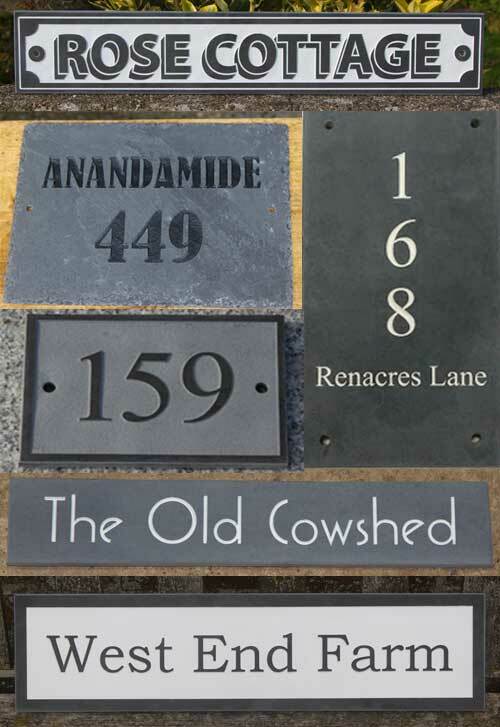 If you are considering a slate or granite house sign - click on the link below.